While looking for something slightly different in the newspaper archives today, we were shocked to suddenly see the face of Leila de Cadiz looking out at us. It has only been two weeks since a blog post on this site lamented the lack of a photograph of this formidable and interesting woman. It's not the best quality, but it's 100% more than what we had! Scroll on down to discover what Leila and her sister Rosalind (aka Maggie and Jane Murphy) looked like. Front page of The Irish Citizen, 22 June 1912. British Newspaper Archive. Leila Garcia de Cadiz, and her sister Rosalind, were militant suffrage activists. They had been brought up in Roscommon before moving to Dublin to take part in protests organised by the Irish Women's Franchise League (IWFL). They also travelled to London, where they were members of the Women's Social and Political Union (WSPU). They were famous for a few reasons. The first was the valour medal that Leila was awarded from the WSPU for hunger-striking and undergoing forced feeding while in Holloway prison. The second was the court-case that the sisters took against the IWFL when they were expelled from the society in 1913. It should be said that they used noms de guerre during these years, and were known as Margaret (Maggie) and Jane Murphy respectively. Their whole story, or as much as we could find of it, is covered in great detail here. There was one thing missing though, in every account of them published or online, and from that blog post. That was their photograph. Until now. Leila de Cadiz. Cropped from the above page. Rosalind de Cadiz. Cropped from the above page. It was while working on Stop 4 of the audioguide today that Leila and Rosalind suddenly came into view. Stop 4 is situated at the Ship Street entrance to Dublin Castle, and is where Hanna Sheehy Skeffington broke windows of government buildings at 5am on the morning of the 13th of June 1912. She was protesting the Home Rule Bill which had been brought before parliament with no mention of votes for women included in it. Other women broke windows in the Customs House and the GPO. South-side post boxes were filled with ink, and a note saying 'Votes for Women' pinned on top. 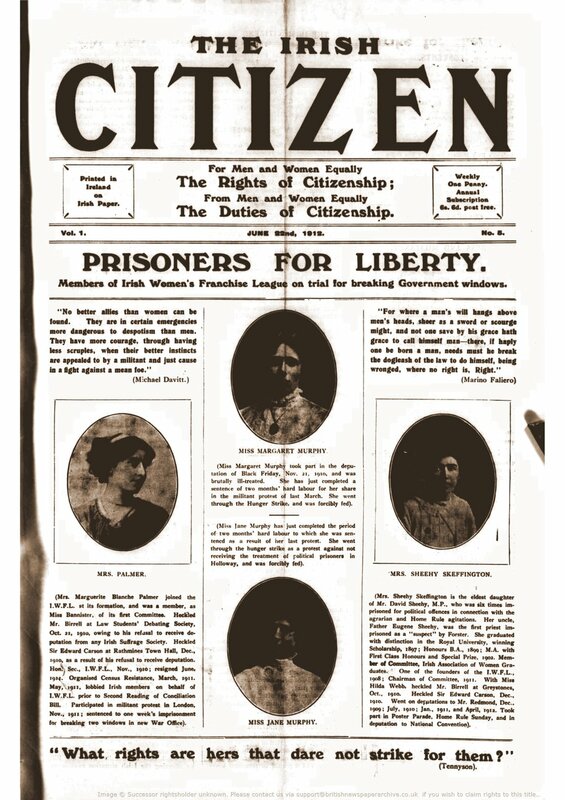 It probably shouldn't have been a surprise then to open the issue of The Irish Citizen which had come out later that week, on 22nd June 1912, and see portrait photographs of four of the women arrested for doing this. But it was! Leila/ Margaret doesn't appear in any newspaper archive search engines, or appeared in photograph form in any of the standard texts on the subject. It just goes to show how serendipitous research can be! You go in expecting one thing - you find another.